My daughters both said their favorite thing was visiting their towns and orphanages. I agree, especially since one of the orphanages was in an area where the official stance is "no visits." Both of these visits were truly special and in different ways, more than we had hoped for. 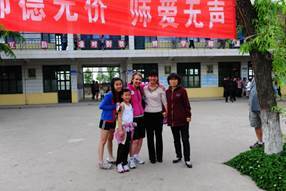 For myself and my husband, seeing our children fall in love with China was the best part of all. When paying someone a visit in an Asian country, it is proper to take and gift and never just “two bundles of bananas” (the symbolic meaning of empty hands – picture each of your hands as a bundle of bananas). Depending on the size of the orphanage or how often visitors return, a visit could can be a highly anticipated event by the staff, or a routine, minor inconvenience to the day-to-day running of the institution. You will want to discuss this aspect of reality with your child and prepare her or him for what it might be like, based on what you find out. It is useful to share with your child about what to expect as well as what to do if things turn out differently than you anticipate. It is important to develop an attitude of flexibility and focus on enjoying the experience rather than to get set on things going a certain way, since things don’t always go precisely as planned on any trip or daily life experience. A gift is always appropriate for the effort expended by the director and or staff to accommodate the visiting family. You can read more ideas on this topic from Amy Eldridge, Executive Director of Love Without Boundaries at Amy suggests , or feel free to drop us a line. Families also often want to know what is appropriate to bring children who remain at the orphanage. It is often best to purchase items once in country. Generally, school supplies (yes, paper, pencils, pens, markers, etc. ), backpacks, books, or a basket of fresh fruit. Know that as you offer any gift, it is customary for a Chinese born person to decline that gift at first offering, especially in an individual’s home. The person may not open the gift in front of the giver. Customarily, a Chinese person will feel it will appear greedy or insensitive to accept a gift at first offering, although accepting gifts for the orphanage kids, this is less so since it is not a personal gift. Chinese place high value on social properness and are not much concerned about appearance and dress, as are Westerners. We at Lotus Travel are often asked about proper attire for an SWI visit, whether for an adoption trip or a homeland trip. A good guideline to follow would be to dress “business casual” for the visit. Keep in mind that the Chinese society is a more modestly dressed society than many Western countries, so it is recommended to avoid short shorts, short skirts or anything that is even marginally revealing. An important, but not always anticipated aspect for an orphanage visit is to be aware that most of the children remaining may have significant special needs. It is best to have these discussions before you travel; likely your child knows another child with a physical or mental disability. This is the type of information you will want your child to understand prior to the visit so they will have a context for this. We recommend that your family invite the orphanage director and staff to lunch. If you do not, they likely will, and then feel obligated to spend quite a lot of the orphanage funds on that lunch, since you are a “foreigner” and this status creates certain perceived responsibilities the Chinese host. Additionally, these visits are arranged for morning times, and lunch it brings a natural conclusion to the meeting time. Doing so also naturally transitions you to explore the home town area on your own to explore the market, visit a potential finding spot, or other points of interest. If you want to invite the caregiver or nanny(s), then you should extend that invitation through the director to show proper respect. It is useful to get current on etiquette and differences, so you do not accidentally insult the director or staff. Click Dining Etiquette & Tips to review a few highlights. You can also create a family night game activity into learning and testing each other on the topicJ! For more tips on preparing your family for the trip, click practical tips, or to review a full listing of books and othe tools click more resources.